Harrogate Town will be aiming to complete their first ever National League double when they entertain Aldershot at the CNG Stadium on Saturday. Simon Weaver’s team ran out 2-0 winners at the EBB Stadium back in August thanks to Dominic Knowles’ 59th-minute strike and a Lewis Kinsella own goal. The sides will renew hostilities this weekend and Town will go into the game as favourites with the Shots currently 17th in the table and on a poor run of form. 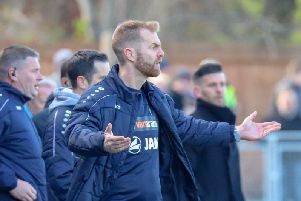 Gary Waddock’s men are without a victory in six games, have won just one of their last nine and failed to score each of their previous four league outings. Their most recent defeat came at the hands of Ebbsleet United on Saturday. Experienced striker Adam Rendell is the Shots’ leading marksman this campaign, though he has just five goals to his name. Town, currently third in the table, head into the contest having lost two of their last three, but have suffered only four league defeats all season. The most recent of these losses was a 2-0 reverse at the hands of Solihull Moors in midweek, and although disappointed by his players' performance on the night, Weaver revealed he will judge them on how react to Tuesday’s setback before considering changes to his starting line-up. “I’ll see how the lads are looking after training on Thursday and Friday and judge them on how they react to Tuesday night,” he said. “Obviously, if anyone is looking leggy then we might decide to freshen things up, but it’s important to remember that we’ve not been playing badly at all in recent weeks. Given Town’s success at Aldershot earlier this season, Weaver is expecting Saturday’s visitors to arrive at the CNG Stadium desperate to take revenge. “That will mean there are two sides going out there with a point to prove on Saturday, which should make for a really interesting match,” he said. Kick-off at the CNG Stadium is at 3pm. For live updates and post-match reaction, follow @HarrogateSport on Twitter.